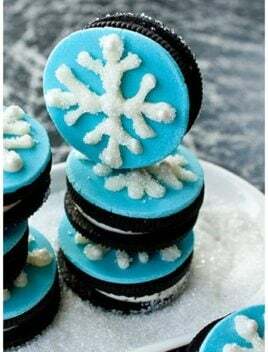 Quick and easy snowflake cookies recipe, made with simple ingredients like Oreos and white chocolate. Great dessert for Christmas and Winter parties. These simple snowflake cookies are so fun and sparkly. You just need basic store-bought ingredients and supplies to make them with kids. No royal icing or fancy cutters needed! They are just as easy as my Snowflake Cake and my Snowflake Cupcakes. No snowflake cookie cutter necessary! Considering the fact that we don’t make these cookies often, it seems unreasonable to buy a cutter that won’t get much use. I have also seen some people get very creative with a star cutter and make snowflakes out of them. 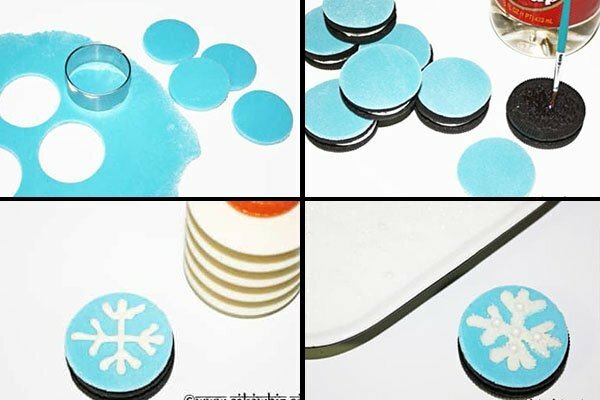 How to make snowflake cookies? Spread frosting on top of Oreos. Stick circle pieces of marshmallow fondant on top of the frosting. Draw snowflakes with melted chocolate. Sprinkle sanding sugar and edible pearls. These would be great for Winter parties, Christmas cookie exchange and even Frozen themed birthday parties. Serve them at a dessert table or give them as a homemade gift or party favor. You can make round sugar cookies instead of Oreos and the rest of the steps would be the same. Instead of royal icing, you can use melted white chocolate, which is much easier. If you are short on time, use store-bought fondant. It’s cheap and can be found on Amazon, Wal Mart, Hobby Lobby, Michaels. Sprinkle sanding sugar and edible pearls before the chocolate sets so that it sticks properly. I used blue fondant but you can use pink, silver or whatever color you like. Do not store these cookies in the fridge because fondant becomes very sticky, when exposed to water or moisture. Roll out fondant and use a circle cutter to cut out some circular pieces. They should be the same size as the Oreo cookies. Brush corn syrup on or spread some buttercream icing on top of the Oreo . Stick the circle fondant piece on top and press it gently. Fill a piping bag or squeeze bottle with melted white chocolate and draw a snowflake on top of the blue fondant. Sprinkle sanding sugar all over the cookie before the chocolate sets and hardens. Stick some edible pearls wherever you like. Brush away excess sanding sugar and enjoy. Leftovers can be stored in a box at room temperature for up to 2 days. These are so adorable, and the perfect way to “fancy up” my cookie trays!